Call us for auto tow service and road side assistance in the Greater Grand Rapids, Michigan area. Russ's Service Garage is ready to help you get our vehicle in for service or back to your residence. We want to provide you with the GR road side assistance you need. Flat tire? Engine Trouble? Run out of gas? 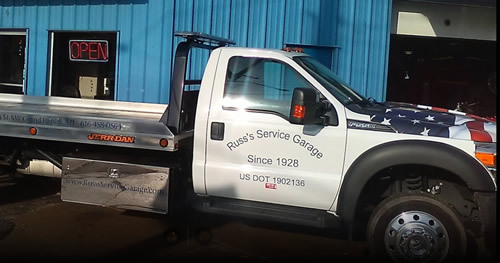 Russ's tow truck service is available to help get you back on the road. We will always do our very best to service your vehicle and get your repairs done in a timely fashion so that you can get on to your daily routine. Call us at 616-458-0564. Subscribe to our email list for special coupons and news about important auto repair service offerings. © Copyright 2010-2017 Russ's Garage. All Rights Reserved.